Leaves Revolution promptly at: 7:50 am. Leaves Revolution shortly after A Ride. This is the signature World Famous Swami’s Saturday Ride. Although it sometimes will take a different route, more often than not, the ride follows the traditional route through the Elfin Forest to Escondido then back along Del Dios and through Rancho Santa Fe to the coast returning to Revolution (total distance ~40 miles). This route is over undulating terrain with roads open to vehicular and other traffic. The World Famous Swami’s Saturday ride rolls out at a casual warm up pace from Revolution rolling north to La Costa Avenue. The pace picks up after the groups turn on to Levante Street. There are a few short sprints throughout the ride and the pace picks up after the warm-up along the coast and La Costa Avenue. Which Ride is best for you? The B Ride – Is still a fast, hard ride but in contrast it is more about what you make of the ride. If you ride at the front and take your share of the pulls through Elfin Forest, it will be a seriously hard and fast ride. If you can’t quite hang on to the riders on the front or just want to ride a little slower then you will ride with other B riders and everyone will re-group at the church. So if you’re “reconnecting” with your bike fitness, or you want to ride at a pace less than full on OMG this hurts…race pace, the B ride is for you. Regardless if you do the A ride or the B ride please remember to ride two by two wherever possible, which means don’t ride 3 or 4 wide on the road, be respectful to other motorists and pedestrians you encounter on the road. Thanks! Having two rides helps even out the gaps between rider fitness levels and gives each group a little more elbow room on the road. Effective immediately, on the first Saturday of each month the B ride will do the traditional route in reverse with the addition of Stud Loop. Tell your friends! There may not be a designated leader on this ride. When deciding to participate in this ride you take on the communal responsibility for the safety of the ride. 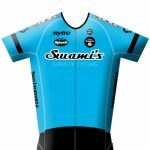 Founded in 1989, Swami’s Cycling Club is one of the premier and most recognized clubs in southern California. We are composed of more than 300 male and female cyclists in the San Diego region who participate in the entire spectrum of cycling activities from the adrenalin-pumping action of racing to mountain bike and fitness rides.